Comments Off on Alfalfa Fall Harvest Guidelines in NY – Should They Change? Alfalfa Fall Harvest Guidelines in NY – Should They Change? Fall harvest management is one of the factors affecting the ability of alfalfa to overwinter successfully. Other factors include the age of the stand, the winter hardiness and disease ratings of the cultivar, the length of cutting intervals throughout the season, soil pH, soil K level, soil drainage, and whether growth is left to catch snow. Once we have planted a stand of alfalfa or alfalfa-grass, the primary two persistence factors we can control are soil K level and fall cutting management. For a number of decades, the policy for alfalfa fall harvest was to insist on a no-cut fall rest period of 4-6 weeks before the first killing frost. This critical fall period allowed root reserves to be replenished and minimized the chances that cutting management would negatively impact overwintering. Adequate time to replenish root reserves was considered 10% bloom by some researchers, while others assumed that 8-10” of top growth in the fall assured maximum root reserve storage, prior to the first killing frost. It also left significant alfalfa residue to facilitate insulating snow catch. What is a “Killing Frost”? The temperature at which alfalfa essentially stops all growth is somewhere between 24 and 28o F. Sheaffer (MN) suggested the first killing frost was 28o F, Tesar (MI) considered it 26.6o F (-3o C), while Undersander (WI) considered a killing frost as 4 or more hours at 24o F. Other studies have used 25o F as the definition of first killing frost. This can greatly impact the date of “first killing frost”. In Ithaca, NY for example, the latest “first killing frost” date for 30 years of weather data occurred Nov. 5 at 28o F vs. Dec. 10 at 25o F. When accumulating Growing Degree Days (GDD) until first killing frost, a low temperature such as 25o F is not reasonable, as all alfalfa varieties with appropriate winter hardiness ratings for the region would have gone dormant well before Dec. 10. During the 1980’s, numerous studies in Canada and the northern USA investigated alfalfa fall harvest management. Research in southern Saskatchewan found that a third cut between Aug. 25 and Sep. 20 reduced spring yields, compared to an Oct. 1 cut. McKenzie et al. (1980) determined that a second cut from Aug. to mid-Sep. consistently reduced future yields in central Alberta, but not in northern Alberta. In Minnesota, Marten (1980) concluded that a third harvest anytime in September would not reduce persistence, assuming it was a winter hardy variety on well-drained soils high in K, and there was consistent snow cover. In Michigan, Tesar (1981) also concluded that a third cut in September or early October was not harmful. Tesar and Yager (1985) suggested that a third cut in September in the northern USA was not harmful as long as there was adequate time for replenishment of carbohydrate reserves between the second and third cuttings. Sheaffer et al. (1986) concluded that fall cutting does increase the risk of long-term stand loss, but that fall cutting will provide short-term higher yields and high quality. They also concluded that length of harvest interval and number of harvests during the growing season were as important as the final harvest date. The first attempt to quantify carbohydrate reserves between second and third cuttings of alfalfa based on GDD occurred in Canada. Research in Quebec by Belanger et al. showed that it may be acceptable to cut during the critical fall rest period in September, as long as there was an interval of approximately 500 GDD (base 5o C) between the fall harvest and the previous harvest. For forage crops in the USA, GDD are calculated using base41, with heat units accumulated above a daily average of 41o F (5o C). These do not generate the same number of GDD units, 500 GDD base5 C is equal to 900 GDD base41 F.
The sum of the above research results caused NY fall alfalfa harvest recommendations to change about 20 years ago to “Allow a rest period of 6 to 7 weeks between the last two cuts”. A similar recommendation in PA of “At least 45 days between the last two cuts” was also adopted. This recommendation has not changed in NY for the past 20 years. Keep in mind that any cutting management options during the critical fall rest period must involve healthy stands of better adapted winter hardy varieties with multiple pest resistance. A comparison of the Quebec 500 GDD base5 C rest period can be made with the currently recommended “6-7 week rest period”. By selecting the years with the least and most GDD accumulated during August and September, a range in days for the rest period can be calculated, based on a 500 GDD interval between the last two cuts (Fig. 1 & 2). If cutting on Sep. 1, the 500 GDD interval prior to Sep. 1 is about 5 weeks (Table 1). If cutting Sep. 30, the 500 GDD interval prior to Sep. 30 is 6 to 7 weeks. 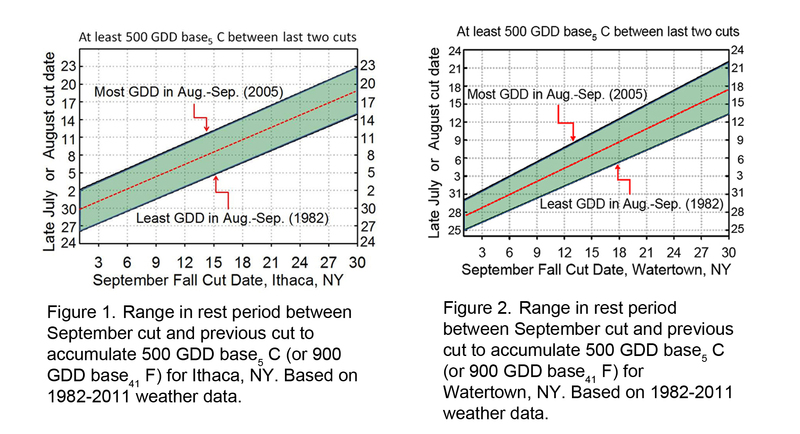 The rate of decline in GDD units per day in the fall is similar for central and northern NY (Fig. 3 & 4; Table 1). All X- and Y-axis date combinations below the shaded boxes in Fig. 1 and 2 identify the rest period interval that will result in 500 GDD before the September cut with high confidence. These date combinations resulted in 500 GDD for all 30 years of weather data. All X- and Y-axis date combinations above the shaded box in Fig. 1 and 2 will be very unlikely to accumulate 500 GDD, as this never happened in 30 years. For example, in Ithaca (Fig. 1) if alfalfa is cut on Aug. 2, it is Sept. 12 before you are out of the rest period shaded zone. Using the 500 GDD concept, our current 6-7 week rest period is appropriate for cutting at the end of September, but could be reduced to approximately a 5 week rest period if cutting Sep. 1. For rest periods based on GDD, the later it is in the season, the longer it will take to accumulate 500 GDD (Fig. 3 & 4). It has been suggested to apply the Quebec research to the period preceding 1st frost, and help define a “no-cut” time interval prior to 1st frost. The assumptions are that we need 500 GDD (base5 C) for alfalfa to build up root reserves. A second assumption is that it is safe to cut alfalfa if there are less than 200 GDD (base5 C) remaining before the first killing frost, as there would be insufficient regrowth to use up enough storage carbohydrates to negatively affect alfalfa persistence. We are presenting this system as an example, even though we were not able to find any evidence in the scientific literature concerning the 200 GDD assumption. A similar example of this concept can be found in Michigan literature (http://www.agweather.geo.msu.edu/agwx/articles/article-09.html), although GDD base41 were used for this example incorrectly. Using the 500/200 GDD criteria, we can approximate the odds that fall mowing will not cause winter injury. Approximate probabilities of either accumulating over 500 GDD (base5 C) or accumulating less than 200 GDD (base5 C), with long-term weather data (30 consecutive years) can be calculated if alfalfa is cut on a particular date in the fall at a particular site (Fig. 5 & 6). Four dates can be determined to approximate 0 and 100% chances of either more than 500 GDD after fall cutting, or less than 200 GDD after fall cutting. For this exercise, we are assuming that the first occurrence of 28o F is a “killing frost”. 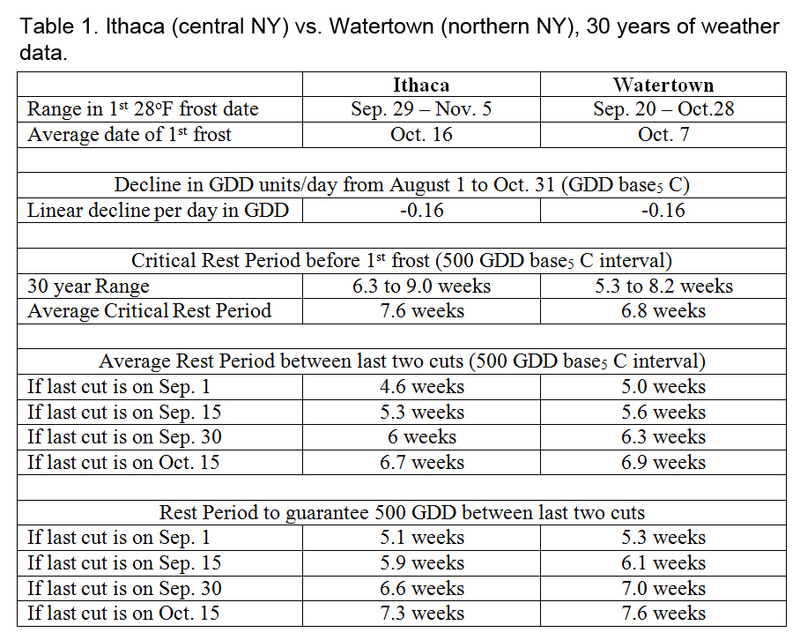 A killing frost in Watertown occurs on average 9 days earlier than in Ithaca (Table 1). a. Year with earliest killing frost date: subtract 500 GDD base5 C (from Sep. 20, 1993). b. Year with latest killing frost date: subtract 200 GDD base5 C (from Oct. 28, 2001). c. Year with latest killing frost date: subtract 500 GDD base5 C (from Oct. 28, 2001). d. Year with earliest killing frost date: subtract 200 GDD base5 C (from Sep. 20, 1993). a. Latest calendar date resulting in >500 GDD base5 C after fall cutting. b. Earliest calendar date resulting in <200 GDD base5 C after fall cutting. c. Earliest calendar date resulting in <500 GDD base5 C after fall cutting. d. Latest calendar date resulting in >200 GDD base5 C after fall cutting. To simplify the display, we then assume a linear relationship between 0% and 100% chances that fall cutting will not cause winter injury. Statistical probabilities could be calculated individually for each day, but the results would not provide clear guidelines. The rate of GDD accumulation into the fall gradually decreases and is not perfectly linear (Fig. 3 & 4), but for practical purposes a linear display suffices. Cutting on Aug. 31, Sep. 1, or Sep. 2, the odds of either accumulating >500 GDD or accumulating <200 GDD in Watertown, NY are approximately zero. Using this system, the date that would maximize the chances of winter injury due to cutting is Sep. 1 in Watertown, and Sep. 6 in Ithaca. Compare Fig. 4 (interval to 1st frost) to Fig. 2 (interval between last two cuts). If alfalfa was mowed on July 25, and then mowed again on Sep. 1 in Watertown, the chances of winter injury due to cutting are near zero for Fig. 2 (with 500 GDD accumulated between the last two cuts all 30 years). So under one system (Fig. 4), Sep. 1 would be the worst date to cut alfalfa in Watertown, while under the other system (Fig. 2), Sep. 1 can be a very safe date to cut alfalfa. It is possible that both systems are reasonable. Allowing a 500 GDD interval before a Sep. 1 cut would make a Sep. 1 cut relatively safe. On the other hand, not allowing 500 GDD before a Sep. 1 cut might make this the worst possible time to cut an alfalfa stand. Keep in mind that winter damage to alfalfa is an accumulation of insults. A weakened stand will be considerably more susceptible to damage from intensive harvest management, as well as mowing during the critical fall rest period. There are several issues more specific to the Northeast/New England, which will likely have an impact on the chances of fall cutting affecting long-term alfalfa persistence. The basic requirement for any cutting of alfalfa during the critical fall period is that near ideal conditions exist. That is, you have a healthy, very winter hardy variety with high soil K, good soil drainage, and good snow cover over the winter. Good soil drainage in NY is often not the case, and consistent snow cover is never guaranteed. In northern NY there is also the possibility of alfalfa snout beetle and/or brown root rot damage, which could greatly affect the consequences of cutting during the fall period. Another NY-specific issue is that of species mixtures. Most alfalfa in the Midwest is sown in pure stands, over 85% of alfalfa sown in NY is in mixture with perennial grasses. For mixed stands with alfalfa, growers may be somewhat less risk averse than with pure stands, when it comes to the chances that fall cutting will result in shortened persistence of the alfalfa component. Loosing alfalfa more quickly from a mixed stand is not quite as catastrophic as loosing alfalfa in a pure stand. With the availability of Round-up Ready alfalfa, the frequency of pure alfalfa stands in the Midwest is likely to increase. Because NY has few prime alfalfa soils, it is less likely that RR-alfalfa will greatly increase the proportion of pure alfalfa stands in NY. Our historical understanding of alfalfa root reserves provides evidence for maintaining a Critical Fall Rest Period for alfalfa. Applying the 500 GDD criteria to the Critical Fall Rest Period, however, results in an average rest period before 1st killing frost exceeding 7 weeks. Past research data provide evidence that a sufficient rest interval between the last two cuts allows us to take the last cut during the critical rest period. There does not appear to be evidence to change our basic logic for fall harvest of alfalfa. Some fine tuning of the rest interval between the last two cuts can be made using Fig. 1 and 2. The above suggestions are for healthy stands. If a stand is not healthy, a more conservative harvest management may increase the chances of stand survival.